The latest Chesterfield magistrates’ court results as published in the September 21 edition of the Derbyshire Times are listed below. Amanda Lesley Jane Hawthorne, 66, of Main Road, Heath, Chesterfield. Indicated a guilty plea to stealing £40 of cash. Must pay an £85 victim surcharge. Indicated a guilty plea to stealing £30 of money. Pleaded guilty to stealing £870. Must pay £1,151.58 compensation and £300 costs. Community order to last until September 7, 2018, with 120 hours of unpaid work. Thomas Daniel Crossan, 21, of Longcroft View, Whitwell. Pleaded guilty to stealing beer valued at £11 belonging to the Co-op, on Spring Street, at Whitwell. Discharged conditionally for 12 months. Must pay £11 compensation and a £20 victim surcharge and £85 costs. Ben Wayde Griffin, 23, of Annesley Close, Chesterfield. Pleaded guilty to stealing two t-shirts valued at £99.98 belonging to TJ Hughes. Must pay a £115 victim surcharge. Pleaded guilty to failing to surrender to custody. Committed to prison for 35 days. Andrew Shane Ferguson, 37, of Shawcroft Avenue, Riddings, Alfreton. Indicated a guilty plea to stealing meat valued at £30 belonging to the Co-op. Must pay £30 compensation. Indicated a guilty plea to stealing Persil products valued at £16 belonging to Wilkinson’s. Must pay £16 compensation. Indicated a guilty plea to stealing meat valued at £35 belonging to the Co-op. Must pay £35 compensation. 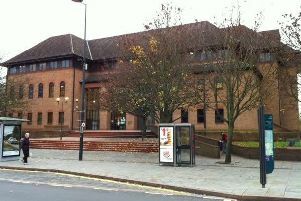 Indicated a guilty plea to stealing Vera Wang and Jean-Paul Gaultier perfume valued at £102 belonging to Asda. Must pay £102 compensation. Pleaded guilty to failing to surrender to custody. Indicated a guilty plea to stealing a kettle and a toaster valued at £50 belonging to Boyes. Must pay £50 compensation. Indicated a guilty plea to stealing a fragrance tester belonging to JH Hurst. Indicated a guilty plea to stealing two bottles of vodka valued at £40 belonging to Co-operative Retail Services. Must pay £40 compensation. Indicated a guilty plea to stealing a Dyson vacuum cleaner belonging to B&M Stores. Must pay £179.99 compensation. Indicated a guilty plea to stealing four bottles of spirits belonging to Co-operative Food Ltd. Must pay £80 compensation. Indicated a guilty plea to stealing two bottles of Smirnoff vodka valued at £40 belonging to Co-operative Food Ltd. Must pay £40 compensation. Indicated a guilty plea to stealing a women’s black jacket valued at £25 belonging to Peacock’s Stores Ltd. Indicated a guilty plea to stealing an Airfax fryer, two knife blocks and three black padded Trespass jackets valued at £150 belonging to W Boyes and Co Ltd. Must pay £150 compensation. Committed to prison for 26 weeks. Shinayde Theresa Ann Strachan, 28, of Houfton Road, Bolsover. Pleaded guilty to stealing Yankee Candles valued at £45 belonging to B&M Bargains. Must pay a £115 victim surcharge and £85 costs. Pleaded guilty to stealing cleaning product, food and straighteners valued at £31.53. Committed to prison for ten weeks suspended for one year with a ten week curfew with electronic monitoring. Abigail Louise Simons, 38, of Denby Bank, Marehay, Ripley. Pleaded guilty to stealing two bottles of vodka valued at £32.98 belonging to the Co-operative Retail Services Ltd. Must pay £32.98 compensation, a £115 victim surcharge and £85 costs. Pleaded guilty to stealing a further two bottles of vodka valued at £32.98 belonging to Co-operative Retail Services Ltd. Pleaded guilty to failing to surrender to custody. Admitted committing a further offence while subject to a 12 month conditional discharge for two thefts from a shop. No adjudication. Dealt with for the original offences which were subject to the conditional discharge of two counts of stealing two bottles of vodka valued at £60 belonging to Co-operative Retail Services Ltd. Committed to prison for 12 weeks suspended for one year with a 16 day Rehabilitation Activity Requirement. Carl Anthony Sherman, 29, of Prospect Road, Old Whittington, Chesterfield. Admitted failing to comply with the requirements of a community order by failing to attend with a responsible officer. No adjudication. Dealt with for the original offence which was subject to the community order of stealing an HTC One A9 phone. Committed to prison for four weeks suspended for 12 months with 84 hours of unpaid work. Shane Rose, 19, of Greenhill Avenue, Ripley. Pleaded guilty to damaging a VW Polo. Must pay £200 compensation. Pleaded guilty to three counts of damaging a police vehicle. Must pay £300 compensation. Committed to prison for eight weeks. Jason Joseph Keith Tighe, 27, of Station Road, Old Whittington, Chesterfield. Pleaded guilty to using threatening behaviour. Fined £80 and a £30 victim surcharge and £85 costs. Gary Newton, 47, of No Fixed Abode. Pleaded guilty to using threatening behaviour. No separate penalty. Pleaded guilty to assaulting a police officer in the execution of his duty. Committed to prison for 12 weeks. Must pay £100 compensation. Adam Doyle, 22, of Catherine Street, Alfreton. Proved in absence he travelled on a railway without having paid a £6.20 fare. Fined £440 and must pay £6.20 compensation and a £44 victim surcharge and £150 costs. Carl James Sherlock, 23, of North Street, Alfreton. Dealt with for three original fraud offences which were subject to a community order of making a false representation by accepting money for mobile phones he did not possess. Community order to last until March 13, 2018, with a six month curfew with electronic monitoring and a Rehabilitation Activity Requirement. David Graham, 33, of New Station Road, Bolsover, pleaded guilty to damaging a bathroom window and a phone cable and to stalking. Community order to last until March 12, 2019, with a Rehabilitation Activity Requirement and 100 hours of unpaid work. He was also given a restraining order to last until March 12, 2019. Aaron James Bostock, 22, of Poolsbrook Crescent, Chesterfield. Pleaded guilty to exceeding the alcohol drink-drive limit. Fined £469 and must pay a £46 victim surcharge and £85 costs. Disqualified from driving for 19 months. Andrew Ward, 35, of Howells Place, Mastin Moor, Chesterfield. Pleaded guilty to exceeding the alcohol drink-drive limit. Committed to prison for eight weeks suspended for 12 months with a 16 week curfew with electronic monitoring. Must pay a £115 victim surcharge and £85 costs. Disqualified from driving for 32 months. John Michael Wood, 41, of Maddock Lake, Brassington. Pleaded guilty to failing to provide a specimen for analysis in the course of an investigation when suspected of having driven a vehicle. Community order to last until September 12, 2018, with a Rehabilitation Activity Requirement and 100 hours of unpaid work. Must pay an £85 victim surcharge and £85 costs. Disqualified from driving for 29 months. Joanne Ebong, 52, of Old Hall Road, Chesterfield. Pleaded guilty to driving without due care and attention. Fined £268 and must pay a £30 victim surcharge and £85 costs. Driving record endorsed with five points. Jaime Canning, 40, of York Crescent, Bramley Vale, Chesterfield. Pleaded guilty to assault by beating. Fined £80 and must pay £50 compensation and a £30 victim surcharge and £85 costs. Claire Norton, 42, of Barrow Street, Chesterfield. Found guilty of assault be beating. Discharged conditionally for 12 months. Must pay a £20 victim surcharge and £120 costs.